Available only at The Container Store, our Birch Elfa Décor Drawer Frame is an uncommonly beautiful way to clear floor space while adding valuable drawer storage. It installs effortlessly and will accommodate any depth of our Elfa Medium Drawers. Install it on two Elfa 16" Ventilated Shelf Brackets in seconds. Birch Elfa Décor Drawer Frame is rated 4.9 out of 5 by 95. Rated 5 out of 5 by DRdogmom from Great looking when installed These birch surrounds are very elegant looking with the platinum mesh inserts. My only caution would be to make sure the mesh inserts are the correct ones for these drawer frames. The platinum drawer frames have a very similar, almost the exact same size, mesh drawer insert but it's off by about an inch and doesn't fit the birch frame. We had some mesh frames from a different project to use, but still had to return 8 platinum mesh inserts and purchase the correct mesh drawer inserts to finish the project. Rated 5 out of 5 by Jitared from Looks like a Million Bucks! I wasn't sure about purchasing this item. It seemed like a big expense compared to a hanging drawer frame and they both do basically the same thing. But by the end of installation, it made me say WOW! I have installed Elfa closets around my house (4 to be exact) and adding this wood frame made a big difference. It is beautiful. It will make whatever you install look more expensive than regular frames. And I'm the only female in the house, so I'm always looking for ways to make my home look more chic and feminine. If only TCS created one for the Elfa CLASSIC 2' Mesh Hanging Drawer, then I would swap all of the frames on all of my closets to this wood frame. Rated 5 out of 5 by DBarr from Elfa System Solutions Elfa is the best system ever. We installed nine closet sytems with Elfa. Rated 5 out of 5 by JSpeedster1 from Remodeling made easy So thrilled to have Elfa in our new home and walk in closet - before and after photos say it all! Thank you Elfa and Container Store Staff! Rated 5 out of 5 by ContainerCA from Easy Installation and Great Closet Organizers This review is for the Elfa closet systems. The whole system is easy to install and adjust. The flexibility of the different solutions provide an efficient and effective closet organizing system. Rated 5 out of 5 by Dale33 from The Perfect Addition We added the drawer frames with both Medium and Large baskets to an existing hanging unit. It really completed the design and greatly added functionality. Saving us from losing space by adding even a small chest of drawers is greatly appreciated. Very smooth action and an easy installation makes this something I would do again in a heartbeat. Rated 5 out of 5 by RivaMike from Closet Organization My wife and I have done four closets in two different homes with the elfa shelving system and we couldn't be happier. From the friendly and knowable design assistance (both in store and on-llne) to the incredible smooth mechanics of the shelving components we're sold for life. We recently added additional drawers to our closet systems and the experience, as always, was exceptional. Thanks for a great product and great staff. Rated 5 out of 5 by MsMini from Elfa collection It is fantastic looks classy, functional, you can maximize your space based on what you use. The staff was so helpful and knowledgeable about the product and had suggestions for us based on there knowledge. It was easy to pick up and assemble. Rated 5 out of 5 by jeweldog from Perfect gliding drawer frame After purchasing our walk-in closet in this color scheme, we found that we could add an additional drawer to our island. So, we purchased this gliding unit and the other pieces required for the drawer itself. So easy to put together. The closet is still a work in progress, but we love it!!! Rated 4 out of 5 by rehana from Good looking and easy to take the whole basket out We have been using decor frame drawers as these glides in and out easily. Using some of these baskets for laundry. I usually carry the whole basket to laundry room, and use stoppers to keep frame and basket in place. Rated 3 out of 5 by wcdogs from Looks nice... I really like the way the drawers look - I have several drawer frames with mesh baskets, as well as the jewelry/accessory tray. However, 2 of the drawer frames have the front piece of wood separating a little from the rest of the frame, and this is after just a month. I'm not pleased with the quality, especially given the cost. Rated 5 out of 5 by SherryB from addition to existing Elfa system I just love this stuff. I keep adding to my existing purchase. Thats what makes this system so great, keep changing it around to meet my changing needs. It's also so easy to change around. Rated 5 out of 5 by JNHK from Drawer Frame My husband and I bought several of these drawer frames for our new elfa closet, and we love them! They glide in-and-out very smoothly, and the walnut finish goes nicely with the walnut fascia in the rest of the closet. These drawer frames are a must-have in any closet! Rated 5 out of 5 by ShyFran from Awesome Purchase!! The Elfa suite is a great purchase. Looks beautiful and very practical too! Rated 5 out of 5 by Kaylan from Great quality and ease to access closet The birch drawer frames look beautiful with the white baskets and make accessing clothes simple! We love our Elfa system. It was completely worth every penny. The store designer was so knowledgeable and friendly. We were able to maximize every inch of our small closet and fit much more than we every thought we could in there! I want to do the guest room closet now as well! Rated 5 out of 5 by Tigers10 from Best Closet System and Purchase Ever! We recently bought a home and I had never heard of elfa though there is a Container Store less than 1 mile away. We had toiled on whether or not to spend the money at this time to do the closets but one trip into the Container Store we decided to have 1 closet designed (Walnut and Platinum), which was to be my husbands closet. I thought it was so incredibly cool and got jealous that I decided to do my walk in (white and platinum). I could NOT be more amazed at how much these closets hold, we put all of our clothing and items that were in three or more dressers and they all fit into our respective closets, including jewelry, ties, shoes, shirts, pants, we even got a matching hamper so we could save space on hampers! We went full out and since we got new closets we had to get new hangers, organizing boxes for sweaters, hangers for scarves, a tie rack, a belt hook rack, robe rack it was AMAZING and the Container store was unbelievable. We are converts to this system and if we could live in our closets we totally would! Rated 4 out of 5 by queenofelfa from Not as useful as most elfa products I wanted to install one basket in the midst of shelving. I found that it wasted too much space because of the space needed between brackets for the basket and brackets for the shelf above it. I did use one at the bottom of a column of shelves because the longest standard didn't come down far enough (high ceilings). This allowed me to use a 3 runner basket to make use of that lower space. Rated 5 out of 5 by Dutchdirkk from Beautiful closet We started with a mental plan of a dream closet. With help from The Container Store(thanks Elizabeth), we stared buying parts we would need. Then we got to the good part, all Top Tracks up, Hanging Standards in place, Shelf Brackets installed. As the shelves and drawers went in ,it took on a finished high end look. With the Birch trim on gliding drawers, and Birch shelves, we love the look and the way it feels. My wife is happy, so I'm happy. I have fun watching her go in just to look. Best of all we can see the floor...now we have a place for everything. Rated 5 out of 5 by KarenP from Nice touch This product is easy to install and looks great, I have received many compliments on our closet designs. Thanks to the website you have all you need to create great closets too. Rated 5 out of 5 by dmohan from Love the look of these! I am so glad we decided to purchase our basket drawers with the frames to match our shelves. It gives it such a clean and put-together look that flows across our playroom walls. Rated 5 out of 5 by Organized2014 from A Visual Delight - No Clutter in Sight! 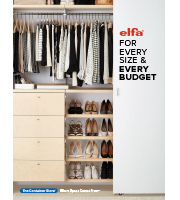 One of my best decisions this year was to reorganize my two closets using the Elfa Closet System. I can’t believe I have more storage space than before the “makeover”! Now when I open my closet doors I don’t cringe because of the clutter! I can find things more easily, i.e. office supplies, clothes, accessories. It was fun collaborating with the Elfa designer at the Container Store and it didn’t take long to finalize the closet design and configuration. The installer was fast and efficient. AND...if I ever relocate I can take my Elfa system with me! Rated 5 out of 5 by johnnyjayhawk from classic look The Elfa system is terrific. Flexible. Easy to install. Great look. Rated 5 out of 5 by bluewhale from Very easy to shop and buy The first time I had seen this stuff, was when I instulled it for a friend. At first it's a little complicated untill you get putting it up, as you go it gets easier. This is a great product and you can design a great space, If you want you can have them help you design. The best part- if you get stuck you can call them and they help you threw your problem. Also this product looks great and professional, it doesn't look cheap! like all the other products out there on the market. Rated 5 out of 5 by goldent from Beautiful decor to go with elfa baskets I bought 5 baskets for my living/dining room because my condo is small but it fit perfectly. I was able to get rid of storage boxes and put my service dog's stuff in the baskets without it being seen, as well as my fitness and bike equipment. It did the trick and looks wonderful. Rated 5 out of 5 by CarpMaster2 from Incredible system I have installed several brands of shelving/closet systems over the past several years. Elfa is by far the best, especially for a nice, finished look. The quality of the materials and excellent quality control make the installation smooth and straightforward. The Container Store staff is second to none! Their knowledge and expertise is demonstrated from the design to packaging the products after checkout. They are always so patient with us when entering and editing a design! Rated 5 out of 5 by TMC712 from Wonderful I love these drawer frames, and the entire elfa system. The drawers glide very smoothly and look nice with the platinum components. So far, we've put elfa systems in our home office closet, guest/craft room closet, garage laundy area, garage storage area, and garage gym area. I hope we're done, but I have a feeling we will be putting even more in the garage in the future. The systems are quite straightforward to install yourself, although you definitely need at least one helper. Rated 5 out of 5 by Archie1976 from SERIOUSLY WHOA!!!!! PHENOMENAL CLOSET SYSTEM I am very obsessed with organizing things and I've heard about Elfa and checked and fell in love with the closet system because I could design whatever I wanted, and I knew that other companies have the same, BUT they CAN'T redesign the closet system. ELFA is the only one that allow you re-organize at later time by removing or adding more or moving. When i bought Elfa, i was asked to hire installer, and I said no. I installed it by myself WITHOUT reading the instruction. That is very simple and use a common sense. After installation, I fell in love with it. Only few holes in the top of the wall near the ceiling where there is a strong wood, and i tried to avoid "drywall anchors". Here is the picture from start to end. Rated 5 out of 5 by JKAL from Love our new laundry room! We pulled out the utility sink we never used and replaced it with an amazing wall of shelves and shoe racks. I couldn't be happier! Our laundry room is now organized, looks cleaner and all the shoes are off the floor! It makes me smile every time I walk through! Special thanks to the Reston, VA designers! Rated 5 out of 5 by MIWAMom from Slick! The visual beauty of the birch makes the utility of the drawer that much better. Easy to install (I did it myself) and I LOVE having drawers built in to my closet system. The wood color adds a lot to the platinum (and I assume the white, as well). Very warm looking. Highly recommended. When fully extended, how far from the wall is the drawer? Can I use this frame to hang the Elfa Medium 3-Runner Drawer White (Item: 256053 Dimensions: 16-7/8&quot; x 20-3/4&quot; x 11-1/4&quot; h) onto a hanging standard? As long as it's a Medium Drawer, it doesn't matter if it's a 1, 2 or 3 Runner. The problem starts when you buy drawers other than Medium. If Purchase a drawer frame, do I also need to purchase a glider? Our elfa decor Drawer Frame has an integrated glide built in. Do I need to purchase brackets to go with this? Install our Elfa D&eacute;cor Drawer Frame on two Elfa 16&quot; Ventilated Shelf Brackets in seconds. One of the plastic clips that holds the mesh basket to the frame broke on me while moving my system. Are those available as replacement parts? Would the drawer labels work with this? Yes, an elfa Drawer Label Holder will work on an elfa Mesh Drawer suspended from an elfa d&eacute;cor Drawer Frame. However, since the handles of the elfa Mesh Drawer are on the side, not the front, of the drawer when it is suspended in an elfa d&eacute;cor Drawer Frame, the elfa Drawer Label Holder will be on the side, not the front, of the drawer, too. I have a freestanding four-rung glide frame stacked with a seven-rung glide frame with medium and small Elfa drawers. Will the decore drawer frame fit the drawers inside this drawer frame? Yes, our regular sized, medium elfa baskets will work with the elfa decor frames. is this available in 12&quot; depth? I need the 12&quot; deep solid shelves and would like matching drawer frames in the same style. is the matching drawer frame (&amp; mesh drawer) available in 12&quot; depth, 2' wide? No, this product is not available in a 12&quot; depth. It attaches to 16&quot; Ventilated Shelf Brackets only.